Our Commercial Air Conditioning Systems range of variable refrigerant flow systems offers the latest technology selected from the leading manufacturers. These systems allow the connection of multiple indoor units of varying types and capacities to a common refrigerant system. This can considerably reduce installation costs and also reduce the space required externally. Unlike systems using a secondary refrigerant these units benefit from direct expansion, inverter drive compressors and sophisticated electronic control, which enables the operating capacity of the system to closely match the required cooling and heating demand. This not only gives superb comfort levels but also ensures outstanding energy efficiency. 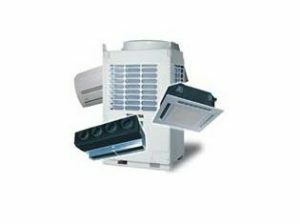 Given the numerous advantages VRF technology offers it not surprising that it has become the preferred choice for many applications. We offer Commercial Air Conditioning System Service Maintenance Contracts and 7 years warranties. Our commercial range can be combined with ventilating / heating systems. All systems can be integrated with smart a BMS to make one intuitive operating system, providing control of operation, temperature and climate.